Flor de Nochebuena, the Christmas poinsettia, is indigenous to Mexico and Central America where the shrub can grow to 15 feet with few branches—a rather sprawling, scraggly thing when compared to the full, bushy cultivated plants we expect to see every December. The man who first brought the plant to America was Joel Roberts Poinsett (1779-1851), a diplomat and politician from South Carolina. He trained in Scotland to be a physician, but left his studies to travel in Europe. He eventually found a career in politics, serving first in the South Carolina legislature, then as U.S. Congressman from South Carolina until his appointment as the United States’ first ambassador to Mexico. His political career culminated with his appointment as Secretary of War under President Van Buren. Poinsett was keenly interested in botany and collected plants throughout his travels for cultivation in the greenhouses at his home. While serving as ambassador in Mexico, he collected live specimens of an unusual plant known as cuetlaxochitl that he found growing in Taxco de Alarcón, southwest of Mexico City, and sent them back to South Carolina for cultivation. He shared the plant with botanist Robert Buist of the Pennsylvania Horticultural Society who, in 1829, exhibited the plant as Euphorbia pulcherrima at the Society’s flower show. By 1835, the plant was being grown enthusiastically in the U.S., Scotland, and England. 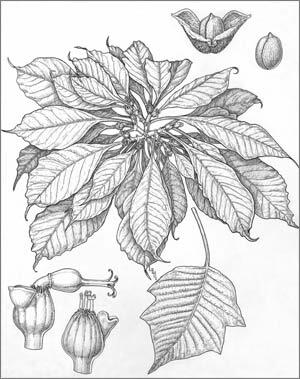 Robert Graham, professor of botany at Edinburgh University, prepared an account of the species for Curtis’s Botanical Magazine in 1836, where he named the new introduction Poinsettia pulcherrima. 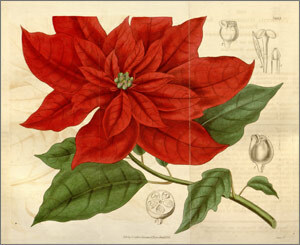 Today, the plant is once again named Euphorbia pulcherrima, but Poinsett’s contribution to horticulture is recognized in the common name “poinsettia”. From Europe, the poinsettia spread throughout the world as a rare winter-blooming plant whose brilliant red bracts could brighten the dreariest days. In America, the plant found its way to California where the climate was favorable for commercial cultivation. The enormous market for poinsettias was largely created by the Ecke family, immigrants from Germany who settled in Encinitas and began selling poinsettias in 1909. Within ten years they were shipping poinsettias to New York and Chicago, and at present, the poinsettia has become the country’s top-selling potted plant, with over 100 cultivars of varying size and color. This appeared in the December 2015 issue of The Desert Breeze, the monthly newsletter of the Tucson Cactus and Succulent Society.